The Aldine Independent School District is a public school district based in unincorporated Harris County, Texas, United States. It serves portions of Houston and unincorporated Harris County. Aldine ISD serves the communities of Aldine, most of Greenspoint, most of East Aldine, and portions of Airline, Acres Homes, Kinwood, Bordersville, and Inwood Forest. The district is part of the taxation base for the Lone Star College System. As of August 2014, Dr. Wanda Bamberg serves as superintendent of schools. The origin and story of the Aldine Independent School District (AISD) begins before the founding of the district itself in 1935. What would eventually become AISD actually started as a series of one-room schoolhouses in the late 1870s located in what was then sparsely populated and rural north and north central Harris County, Texas. In 1876, after a series of new education laws, Harris County authorized the creation of several school communities. Harris County School Community No. 1, the Westfield School Community, was established by W. L. Higgs, H. Illonefield and James McLeod on September 30, 1876. Harris County School Community No. 13, the Durdin School Community, was established by G. L. Durdin, Pleasant Smith Humble, and H. Smith on December 22, 1876. On 18 November 1881, the trustees of Westfield Community No. 1 (H. Tautenhahn, Redding Jackson and S. Yarborough) were authorized to sell off the old school house and one acre of land, and put the proceeds towards the debts against the new school house. On 17 February 1882, the area was defined as Harris County Election Precinct No. 23, with the following boundaries: "Beginning where the HE & WT Railroad crosses the line of Harris and Montgomery Counties. Thence with County Line to mouth of Cypress Creek. Thence up said creek to the east line of the G H Delesdernier survey. Thence with line of Delesdernier & Walters surveys to SW corner of Walter Survey. Thence to head of Halls Bayou. Thence to HE & WT Railroad at or near N. W. Corner of Harris and Wilson Surey. Thence with said Railroad to place of beginning. The voting place of said precinct shall be "H. Tantenhahn Store" and H. Tantenhan the Presiding Officer (voting) there of." In 1883, 38 students were being educated in the Westfield community, and 20 students in the Higgs community. In the mid-1880s, the Harris County Commissioners Court consolidated the local school communities (Higgs and Westfield) into one school district: Harris County Common School District 29 on 18 June 1884. A single three-person board directed activities of the district for four decades. For the 1909–1910 school year, teachers included: Nellie Mae Pattison (Higgs), Mary S. Smith (Aldine), Alice Haley (Aldine), Fannie B. Smith (Westfield), Pinkis Ellisor (Hartwell), and Minerva Jones (Hartwell). Ida L. Green taught colored students at the Higgs School. Trustees were E. H. Durdin, W. G. Jones, and Harry Ashton. A trustee election was held on 9 April 1910 at the Higgs and Aldine Schoolhouses. W. G. Jones was elected over A. W. Charpiot and . R. Tautenhahn. On 19 February 1910, a schoolhouse bond of $8,000 (for constructing and equipping a public free school building of wood material) was passed by the citizens. School trustees for 1911–1912 were W. G. Jones, E. H. Durdin and George W. Shramm. Principal of the Aldine School was L. D. Washington. In 1912–1913, District 29 had three intermediate schools (grades 1–7): Aldine, Westfield and Higgs. It also had one high school that educated students in grades 8 and 9: Hartwell. School trustees were E. H. Durdin, W. G. Jones and Harry Ashton. Teachers for that year were Nellie Mae Patterson (Aldine), Alice Haley (Aldine), Fannie B. Smith (Westfield), Pinkis Ellisor (Hartwell), Minerva Jones (Hartwell). For 1913–1914, the Westfield school was not in operation. The Brubaker community was added as other districts around Aldine were dissolved. A 1934 map of Harris County school districts shows (1) the Aldine School near the intersection of Aldine-Bender (today's FM 525) and Aldine-Westfield, (2) the Brubaker School near the intersection of Blue Bell Road and East Montgomery (today's Airline Drive), (3) the Higgs School on Lee Road at Garners Bayou, just south of Humble-Westfield Road (today's FM 1960), (4) the Westfield School on the south side of Humble-Westfield Road (FM 1960), just west of Hardy, and (5) the Hartwell School near the southwest corner of Humble-Westfield (FM 1960) and Aldine-Westfield Road. On June 18, 1932, District 29 residents voted 123-44 for a $40,000 bond to consolidate the four white schoolhouses (Aldine, Brubaker, Higgs and Westfield) into one new centralized school. This two-story brick building would contain 12 classrooms and an auditorium. It would house grades 1-7 and allow the district to offer high school classes (grades 8 and 9) for the first time since the Hartwell School had closed. When the 1932-33 school year began, high school students met at Memorial Baptist Church, located at East Montgomery Road (today's Airline Drive) and Gulf Bank. The new, as yet unnamed school opened in February 1933 at the intersection of Aldine-Bender Road and Aldine Westfield and immediately was filled to capacity. District 29 added grades 10 and 11 in 1933-34 to complete what was then considered a full high school program. On May 25, 1934, the now-christened S.M.N. Marrs School graduated its first class, consisting of nine students. S. M. N. Marrs was named for Starlin Marion Newberry Marrs, who served as the state superintendent of public instruction for Texas from 1923 to 1932. Roughly a year later, in the spring of 1935, District 29 absorbed part of Common School District 49, also known as the North Houston District. In the mid-1930s, more and more common school districts across the state were becoming independent school districts. On May 4, 1935, voters in Common School District 29 approved creation of the Aldine Independent School District (AISD) by a 128 to 28 margin. Being independent created several advantages for the district, which included (1) more local control, and (2) increased taxing authority. Common school districts did not collect taxes. They received appropriations from the county based on taxable land in their boundaries. By becoming an independent school district, the district could tax property directly and be out from under the control of the Harris County School Board. With the S.M.N. Marrs School filled to capacity, AISD voters approved 57-14 a $25,000 bond for construction of a new 10-classroom junior/senior high school building on September 7, 1935. This new building opened in 1936 next door to the Marrs School on Aldine-Westfield Road. It too was named S.M.N. Marrs. AISD acquired part of Common School District 26, also known as the White Oak District, in 1937. This added portions of Acres Homes to AISD. Included was the White Oak School, which became the district's school for blacks. In the spring of 1948, AISD opened a yet another high school located immediately to the north of S.M.N. Marrs High. This school was named Aldine High School, after the nearby community. The former Marrs High School was turned into a junior high school. In 1953 a second elementary school was built at 222 Raymac and was named Inez Carroll after a former educator in the district. On November 24, 1954, the main building of Aldine High School was destroyed by a six-alarm fire. A new high school campus was built in 1956 at 11101 Airline Drive at West Road on the site of the former Gulf Coast Airport. Several schools have since been built in the district. The district was one of five 2004 and 2005 National Finalists for the Broad Prize for Urban Education. Aldine is also the second best large school district in Texas for educating African American students and is ranked third among large school districts in Texas in educating Latino students, according to recent studies conducted by Texas A&M University and the University of Texas-Pan American. AISD's school board was one of 24 school boards across the nation, and the only one in Texas, to receive the coveted Magna Award for 1999 from the American School Board Journal. The board was also named the 1998 Outstanding School Board of Texas by the Texas Association of School Administrators. For the 2014-2015 school year AISD had a total enrollment of 69,716 children. The district classified 82.3% of students as "economically disadvantaged" while 71.7% were identified as being "at risk". During the 2013-2014 school year, AISD had an attendance rate of 95.1%. During the 2014-2015 school year, 6.8% of students were in AISD's Special Education program. 26.8% of students were in AISD's Career/Technology Education program. 22.4% of students received Bilingual Education while 9.9% of students received ESL Education. 4.3% of students received Gifted and Talented education. AISD is a predominantly minority school district. It is made up of 60.8% students of Hispanic origin, 32.2% students of African American origin, and 4.8% students of white origin. Around 1977 AISD was almost 75% White. During that year the Federal Government of the United States forced Aldine ISD to adopt a desegregation plan. Enacted in 1978, the plan forced the district to redraw attendance boundaries so that no school was more than 30% black. As of 2002 Hispanic students made up the majority, African Americans were 33%, almost double the 1977 statistic, and less than 8% of the students were White. As of 2002 the desegregation order was still effect, and the district was the only Greater Houston school district in Texas still under a federal segregation court order. The order asked for schools to have a percentage of African American students within 15 percentage points of the district wide Black enrollment. Therefore, in 2002 schools were required to have between 18% and 48% Black students. The court order forced AISD to keep African-American faculty within 5% of the overall district percentage points for elementary schools and within 10% of the overall percentage points for secondary schools. The AISD administration criticized the court order, saying the guidelines were impossible to meet, and started an effort to have it ended. The desegregation order was removed by a federal judge in December 2002 and the attendance boundaries were redrawn. As of 2011 most AISD students attend the school closest to where they live. 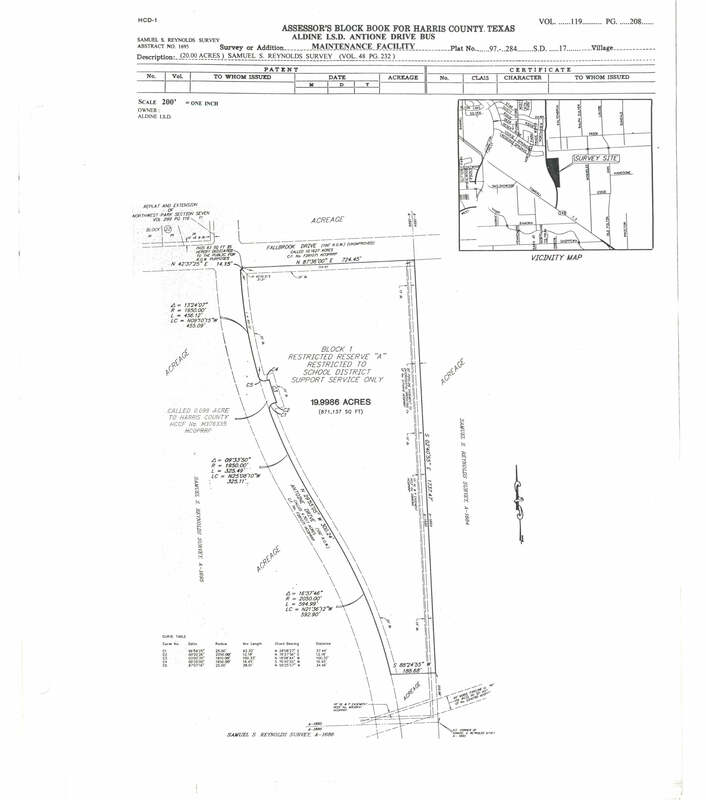 As of the 2010–2011 school year, the appraised valuation of property in the district was $12,523,849,000. The maintenance tax rate was $0.113 and the bond tax rate was $0.017 per $100 of appraised valuation. In 2011, the school district was rated "academically acceptable" by the Texas Education Agency. Forty-nine percent of districts in Texas in 2011 received the same rating. No state accountability ratings will be given to districts in 2012. A school district in Texas can receive one of four possible rankings from the Texas Education Agency: Exemplary (the highest possible ranking), Recognized, Academically Acceptable, and Academically Unacceptable (the lowest possible ranking). The current headquarters building is the M.B. Sonny Donaldson Administration Building, a two-story facility in unincorporated Harris County, Texas, across from Nimitz High School. The school district acquired the facility in spring 2015 from Baker Hughes and opened it on March 21, 2016, with the dedication ceremony on April 19 of that year. The funds to purchase it came from the general operating budget. The previous headquarters were in East Aldine. After serving as the headquarters for a period of over 50 years, the former headquarters exclusively became the house of the district's Career and Technical Education and Student Services departments. ^ a b c "Texas School Directory 2012" (PDF). Texas Education Agency. Retrieved 11 July 2012. ^ "Superintendent". Aldine ISD. Archived from the original on 25 October 2014. Retrieved 11 August 2014. ^ a b "Aldine ISD Fast Facts". Aldine ISD. Archived from the original on 8 July 2014. Retrieved 11 August 2014. ^ a b "Search for Public School Districts – District Detail for Aldine ISD". National Center for Education Statistics. Institute of Education Sciences. Retrieved 27 March 2012. ^ "District Directory Information". National Center for Education Statistics. Retrieved 11 August 2014. ^ District Map (Archive). East Aldine District. January 2012. Retrieved on May 1, 2014. ^ Director's School Record for Harris County. p. 62. ^ Director's School Record for Harris County. p. 74. ^ Harris County Commissioner Court Minutes. Vol. D. 1881-11-18. p. 360. ^ Harris County Commissioners Court Minutes. Vol. D. 1882. p. 295. ^ Texas School Journal. Vol. 1. Houston, Texas: Texas Educational Journal Publishing Co. Jan–Dec 1883. p. 194. ^ Harris County Commissioners Court Minutes. Vol. E. 1884. p. 104. ^ Report of Harris County Schools for the year ending August 31, 1910. Houston, Texas: Cargill Company. ^ Harris County Commissioners Court Minutes. Vol. P. 1910-04-19. p. 220. ^ Harris County Commissioners Minutes. Vol. P. 1910-06-30. pp. 308–309. ^ Report of Harris County Schools. Houston: Dealy-Adey. 1912. ^ Pugh, L. L. (1913). Report of Harris County Schools. Houston. ^ Pugh, L. L. (1914). Report of Harris County Schools. Houston: Rein & Sons Company. ^ "School District 29 Votes $40,000 Issue". Houston Chronicle. June 19, 1932. ^ "New School Planned In Aldine District". Houston Chronicle. August 23, 1932. ^ "District Has Dispute Over School Site". Houston Press. August 23, 1932. ^ a b "Aldine School Building Nearing Completion". Houston Post. February 5, 1933. ^ "4-Year School Is Slated". Houston Post. May 21, 1933. ^ "Aldine School Exercises Will Be Held Friday". Houston Post. May 20, 1934. ^ a b "Westfield-Aldine District Votes for Independent Area". Houston Chronicle. May 5, 1935. ^ Meaux, Robert. "History of local school districts". ^ "Aldine School Bond Issue Is Approved". Houston Post. September 8, 1935. ^ "Many Schools Over County Open". Houston Chronicle. September 9, 1936. ^ "Schools At Aldine Open Term Monday". Houston Post. September 12, 1937. ^ Aldine High Roundup. 1948. ^ "Aldine's School Loss $400,000". Houston Chronicle. November 25, 1954. ^ Jackson, Ron. 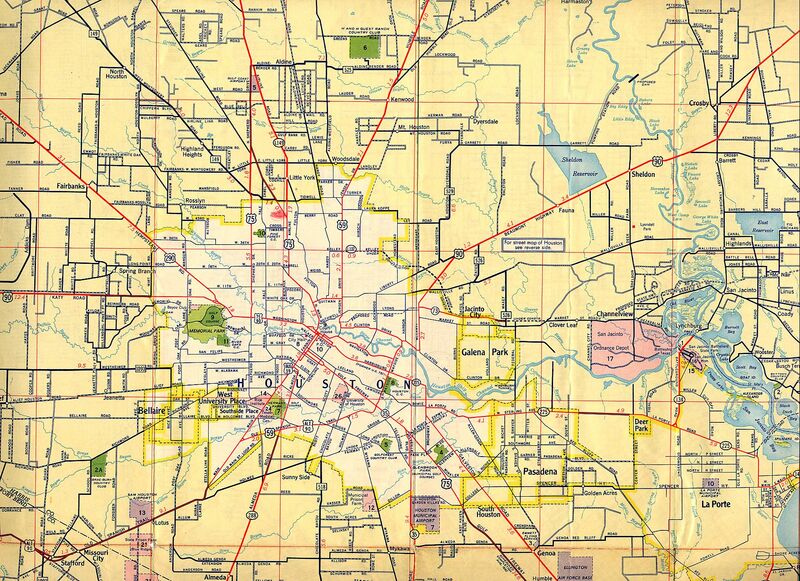 "Humble Oil 1952 Road Map of Houston". TexasFreeway.com. TexasFreeway.com. Retrieved 14 August 2012. ^ a b c d "AISD: Student Data". Aldine ISD. Retrieved 23 December 2015. ^ "Schools seek end of desegregation order." Associated Press at the Victoria Advocate. September 22, 2002. Retrieved on January 20, 2011. ^ a b "2011 Accountability Rating System". Texas Education Agency. Archived from the original on 28 June 2012. Retrieved 11 July 2012. ^ "Central Office Location." Aldine Independent School District. Retrieved on January 12, 2017. ^ a b "Aldine ISD’s Central Office is relocating." Aldine Independent School District. Retrieved on January 12, 2017. ^ "School Directory Archived 2014-05-05 at the Wayback Machine." Aldine Independent School District. Retrieved on May 5, 2014. "14910 Aldine Westfield Rd., Houston, TX 77032"
Harris County Block Book maps, Aldine ISD Antoine Drive Bus Maintenance Facility (JPG, PDF). Volume 119, page 208. Wikimedia Commons has media related to Aldine Independent School District. Mellon, Ericka. "Aldine named best urban school system in America." Houston Chronicle. September 16, 2009. Cleveland ISD extends into portions of Montgomery and San Jacinto counties, and Tomball ISD extends into portions of Montgomery County. Other districts in those counties are served by Region 6 ESC.